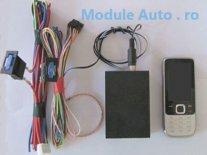 AMTS GSM C02 is an electronic device which can start your car engine from a distance. Using ML20GSM communicator, you can start your engine car by a simple call to the car (can be short call, SMS or DTMF code). After the engine has started the user will receive a call from the car to know the engine is turned on. AMTS GSM can be configured after the engine is started to turn on the heating or cooling car systems or to activate defogger function. AMTS system is composed by: electronic device for starting the engine, RFID chip reader and, as optional, a chip reader directly from the key (when it is not possible to remove the RFID chip from the second key). A very important function is that to ensure the gear box is not engaged before trying to start the engine. The AMTS system will not start the car if the gear box is not in neutral position and the hand brake is not engaged. The system includes 4 power relays for satrting the engine; the user must provide the RFID chip (usualy it is removed from the second ignition key). All the parameters of AMTS can be programmed and modified using a PC software and can be downloaded for free from bottom page. AMTS system is 100% safe and the risk your car to be started by another person or to start the engine when the gear box is not in neutral position is zero. In the premium version, the system is complete: auto start + chip reader directly from key + ML10GSM + USB-UART cable (215EURO price), a factor that is a major advantage over similar systems on the market. The chip reader has two modes of operation: either through the chip inside the key or through the key itself. 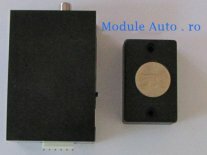 The key / chip is not visible inside the car, which is mounted alongside the car module, so remote car starting is safe. To make sure that the remote car startup is functional for any type of vehicle, starting the starter has two operating modes: by reading the engine speed or by reading the battery voltage. Initial position: the driver in the car, the engine running, the car removed from the gear (for manual gearboxes), the handbrake is down. Pull the handbrake (with the foot brake pressed). Command to the mode by pressing the valet button. If the procedure has been performed correctly, the engine will continue to operate even after the ignition key is removed. The engine stops automatically after the driver leaves the car and closes the door. If any door opens after the procedure has been executed and the car engine is not running, the procedure must be restored from the first step because it is canceled! as well as against theft. so the car can not leave the place. 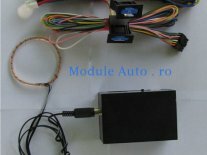 După achiziţionarea produselor dorite de pe www.module-auto.ro, prin intermediul formularului de contact sau telefonic, produsele sunt livrate prin curier rapid cu plata ramburs și costul transportului suportat de cumpărator. © 2019 module-auto.ro - Toate drepturile rezervate.